One grocery store just introduced what they call a “relaxed” checkout lane to accommodate shoppers who prefer to take things a little slower. The line’s always long and slow-moving — and that’s the way people like it. It’s part of a joint initiative created by Alzheimer Scotland and a Tesco supermarket in Forres, Scotland. It’s the first of its kind in the country. And while it was designed with Alzheimer’s patients in mind, they’re not the only ones who appreciate it. When Menzies walked into the Tesco store last month to give a presentation to employees about how to interact with shoppers with dementia, she never expected to make such a big impact. The staff wanted to make sure they were including all of their customers, and designated a checkout lane “relaxed” within a week. “We’re removing that pressure that comes with express checkout and that fast lifestyle altogether,” Menzies said. Tesco employee Kerry Speed, who helped facilitate the project, said the store has sessions about every 8 weeks to educate staff members on a variety of topics, including how to work with customers who have special needs. In January, Menzies, as part of Alzheimer Scotland’s Dementia Friends program, discussed how to break the stigma. That’s when Speed came up with the idea to create the special checkout lane, and broached the subject with the store’s manager. The special slow lane has now been open for more than a month, and customers appear to like it. 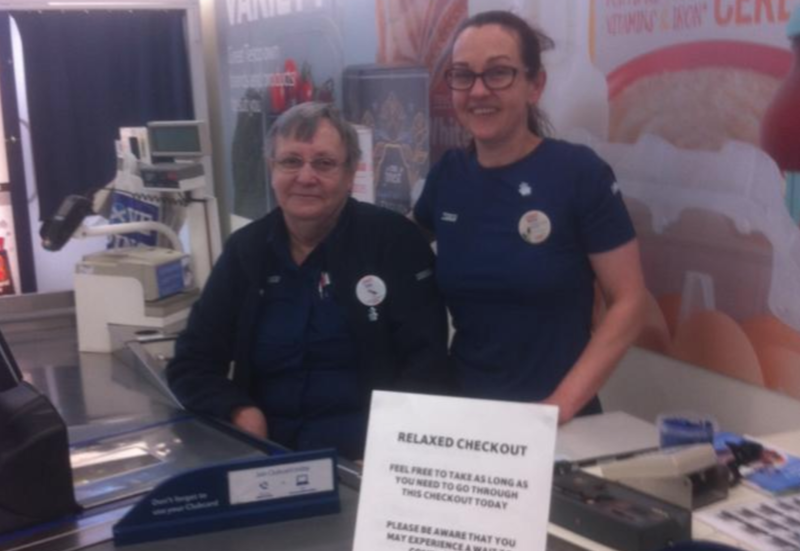 Though Alzheimer Scotland hadn’t planned on floating the idea to other stores, Menzies said they’d be more than happy to help businesses that are interested in implementing relaxed checkouts. “When everybody gets together we can really help people,” she said.